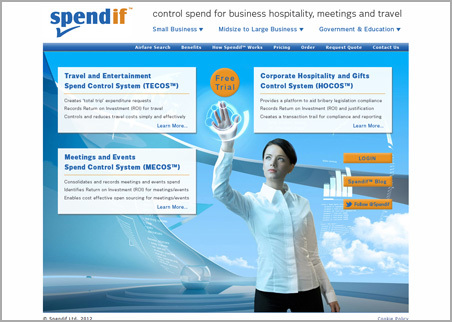 Spendif is a spend control system which is sold by our client as a licensed software service. The front end is essentially to enable clients to register and log-in to the bespoke, specialised functional backend. Once one of our clients customers has purchased a license they are able to use the Spendif system as a cloud based record of their spending on business hospitality, meetings and travel. TECOS™ helps control and reduce business travel and entertainment costs by introducing a system of trip authorisation, recording and budget analysis. MECOS™ helps control and reduce meetings and events costs by introducing a system for events authorisation, recording and budget analysis. HOCOS™ helps enable compliance with anti-bribery legislation such as the UK Bribery Act, by recording the giving and receiving of corporate hospitality and business gifts. It enables individuals to record details of all activity, to help ensure compliance with legislation and an organisations stated policy and to then request approval to go ahead with the activity proposed. Call: 020 3289 4500 / or contact us. Bespoke, Responsive, Touch-optimised web design & development. Bespoke ecommerce and other functionally rich websites built from the ground up specifically for your business processes.